Comments Off on I will be speaking at CollabSphere 2018! Posting removed. Thanks for all the great candidates! This is my first in a series of tips regarding SmartCloud Hybrid Notes migrations and administering SmartCloud Hybrid Notes environments that aren’t always obvious. First, as a user, I will say that the more I use SmartCloud Notes, the more I like it. Yes, when doing administration tasks I keep bumping into walls that, as an experienced administrator, I wish weren’t there. But I have seen the problems that a bad or malicious administrator can reek on a system given the opportunity and I am thankful for the excessively tight security. After all, one of the biggest reasons to go to SmartCloud is so you don’t have to administer mail servers, right? As usual, the system administrators are the last ones to get a UI that makes sense. No surprise since there is only 1 administrator for every few thousand end users. The SmartCloud Web Administration screens aren’t very efficient and can be downright frustrating to use at times, especially when you are accustomed to using the Notes Administrator client. For example, let’s say you have a mixture of mail templates in use and you need to move everyone using one template to a different one. There is no way to see what template is applied to each mail file via the web admin interface. At this time it simply can’t be done. But you can use your Notes Admin client to find them. While the SmartCloud servers won’t show up in the list of servers in your domain and you can’t view the directory in SmartCloud to add those servers in bulk, from the pulldown menu select File – Open Server and enter the server name to gain limited access to the server. The SmartCloud servers will even appear in the Open Server dialog list if you have opened mail files on them already. Be sure to bookmark your SmartCloud servers in your favorites too, so you don’t have to go through this process every time. While there aren’t many actions you can take here, it does make it easier to do tasks like open mail files for troubleshooting, view the database properties, see who is approaching their quota, etc. That’s right. You read the headline correctly. I’m not the only Lotus professional working on the Office 365 project. My friend, a fellow Lotus professional just joined the team. Surprisingly, I didn’t know anything about it until a week before he started. Now you might be asking yourself: “What would Microsoft need Lotus professionals for?” No, it has nothing to do with things like mail migrations. It’s all about BlackBerry Enterprise Servers and messaging. I think this illustrates more than ever that if you have universal skills, like understanding the concepts of messaging or troubleshooting, you are highly marketable, regardless of the details of what product those skills are used on. It’s not about being a professional of a particular brand. It’s about being an expert of a process. Conceptual understanding transcends the syntactic details. Demonstrate that and you will display higher value (DHV). Yes, my friend, welcome to the team. In my May 30, 2011 post I explained that I had started a project at Microsoft where I would be working with the BlackBerry Enterprise Server (BES) team in Office365 to improve the process for building the BES servers, streamlining the process, reducing the bugs, and clarifying the instructions for the build team. Well that project has come to completion and the results were fantastic. We accomplished everything we set out to do and I made some great new friends in the process. It is rewarding to know my skills can easily port to a different platform and that I could be so successful regardless of the brand of software. (Let that be a lesson to all techies.) Technical writing, process improvement, troubleshooting, teamwork were all more important than a detailed knowledge of the software. I was looking forward to the opportunity to see Microsoft software deployed and used the way its developers intended, using all the best practices and perhaps have my opinion changed by the experience. To that end, I was both impressed and disappointed. The infrastructure is very sophisticated and well managed. Everything you would expect. Yet I was surprised at how some technology was used. I often asked myself things like “Why are we having this big reply-to-all email conversation instead of just using a discussion forum or Teamroom?” or “Why are we creating online instructions in Word documents?” Well at least now I understand the reasoning behind why certain Microsoft software features work the way they do. I may find myself back there working on another project, perhaps on another team and get a totally different experience. Actually, I hope so. It’s a big, diverse company and I expect, like most large companies, different teams work in different ways. Meanwhile, I am back in the world of IBM and social business and I will continue to share the knowledge of collaboration and social business here in a region where it is needed most, only now with a deeper understanding of both brands. Every year at Lotusphere in the Ask the Developers session someone will ask IBM “When are you going to make the Passport Advantage website user-friendly? 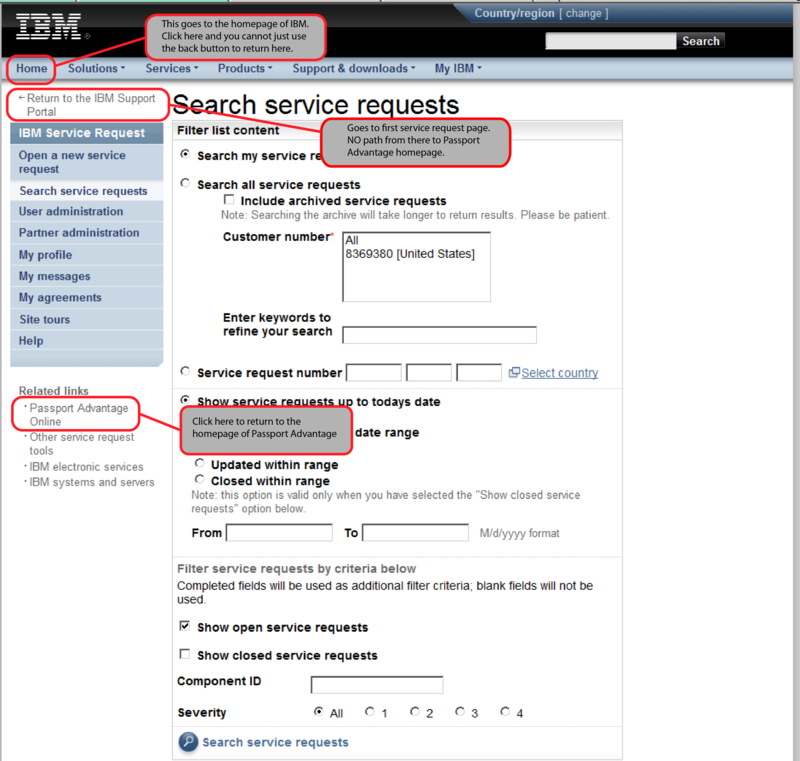 !” And every year the response from IBM is “What are you talking about? It’s fine!” Apparently usability studies are unnecessary. After all, this is IBM. How could the world’s second or third largest software company NOT know how to build a website? Who are we to give them advice, right? We’re just customers, not experts on web development, right? 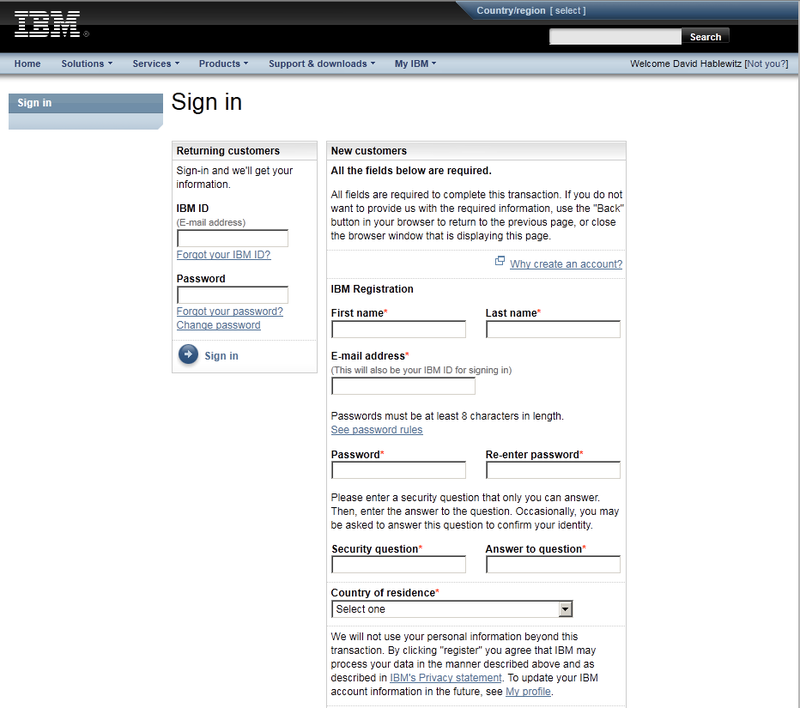 We are mere ersatz of IBM’s erudite web developers. Well recently I have been refreshing my web development skills in a degree program at Bellevue College and I would like to think I have become more than just a dilettante of web design. As part of my studies, I am using the Passport Advantage website as a case study in best (and worst) practices in web design. I would like to bring you along for the lesson. 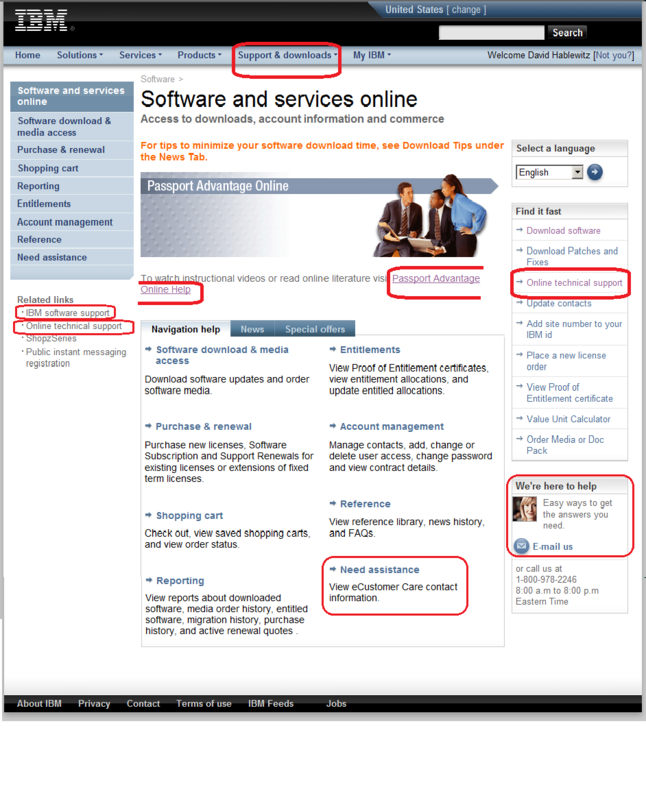 Please join me in this discussion of what does and doesn’t work in web design, particularly as it relates to the success of the IBM Passport Advantage website in achieving its goal. Hopefully by this vetting, all of us can learn something from this world class international website representing the third most valuable brand in the world. My classmates don’t have access to log into this website. So I will include some screen shots. Hopefully this does not infringe on any copyrights. This is intended for review by my classmates in the web design class and web authoring program for educational purposes only. Not exactly an intuitive URL. Note in the screen shot that it already knows who I am. Am I logged in? Well, no. I need to click on the Customer sign in link in the box on the right labeled “Fast Access”. Note that it instructs to use my email address for the user name. Not exactly. Some accounts (like mine) require the username that was created, NOT the email address. Great now you’re on the “homepage”. There are primarily 2 reasons most Lotus professionals visit this site: 1. To open a PMR with technical support or 2. To download software. Let’s start with getting technical support. Look closely. There are no less than 7 links to get some kind of help, not counting the phone number listed in the bottom right corner, which by the way, is NOT the number to call to reach technical support. Each of these 7 links go to different pages. The one to open a ticket with technical support (called a PMR) happens to be the last one in the left pane, labeled “Online technical support”. This would seem obvious but for the 6 other links to support on the page. By the way, if you visit a page and then hit the Back button, you will occasionally get an error instead and it will prompt you to log in again. 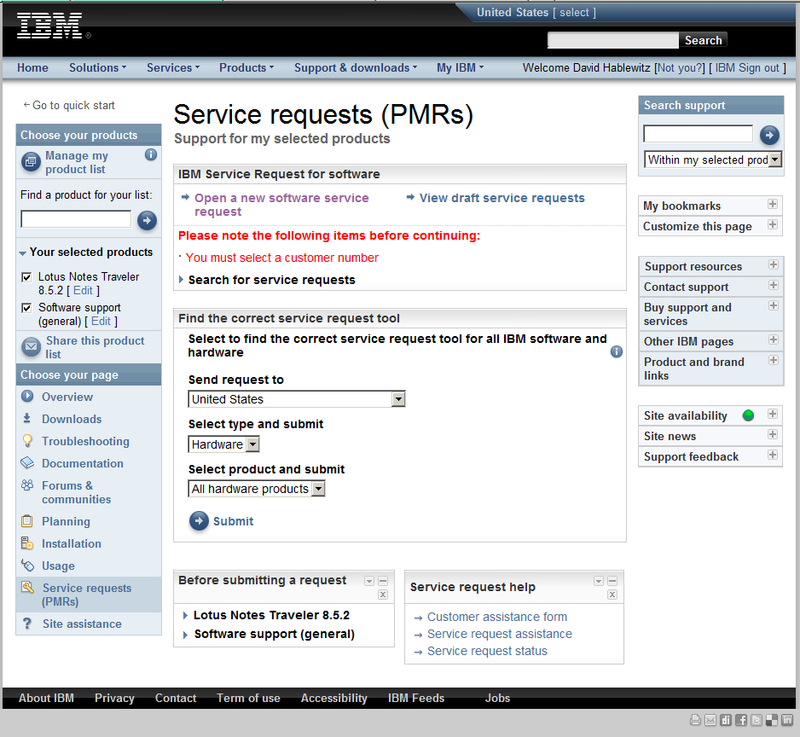 Once you get to the place to enter a PMR with technical support, you may want to get back to the “homepage”. Which link on this page do you think you should select? If you chose Home you would be wrong and once there you would not be able to use the back button to return here. The correct link is actually under related links. Go figure. Now let’s look at the second common reason to visit this site: downloading software. For this function you “only” have 5 choices. Again, they all go to different places. Choose carefully. You may navigate through several lengthy steps before realizing you’re in the wrong place to find what you’re looking for. 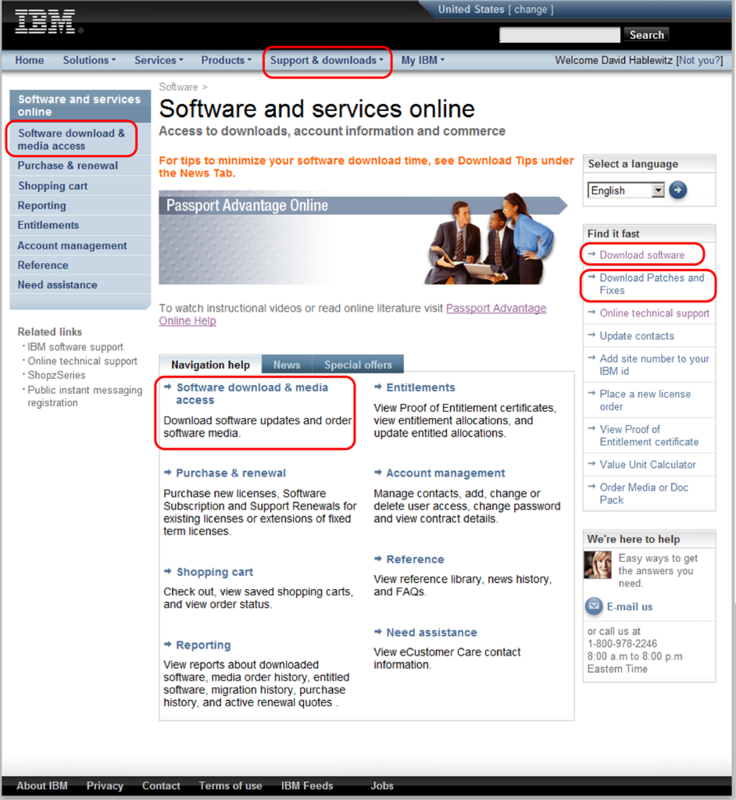 The downloads process continues through several confusing steps including prompting TWICE that you accept the software agreement, before actually getting to download the software. And you had better know exactly what you are looking for. There are no useful descriptions of the purpose of each software and many have very similar names. Well, there you have it. 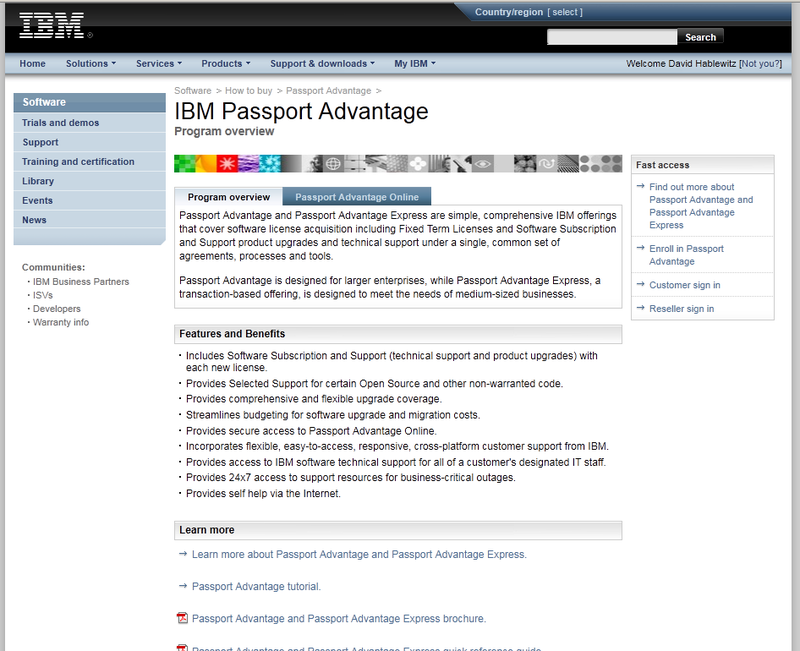 So far we have examined the pages leading up to the main page of the Passport Advantage site and the main page itself. What do you think? Is this analysis off the mark? If you regularly navigate this site, what has your experience been with it? 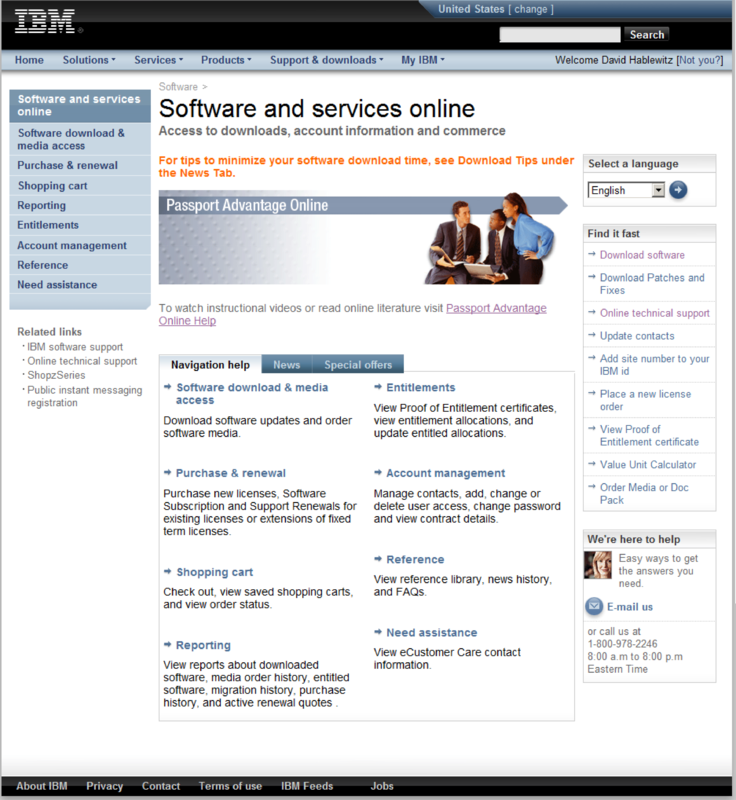 Up next if I have the time and patience: Stepping through the website to download software – no trivial task. After a few minutes of frustration I had to quit viewing it. The wizard was tiny. The navigators to advance the slides are so small I had trouble getting my mouse in just the right spot to click it. There are pages and pages of blah, blah, blah. It isn’t a tutorial about USING the website. It’s about 45 minutes of reading all about WHY you should BUY it. Brand as Mythology: Could the Lotus brand elevate to Mythology? Here is an interesting perspective on branding, marketing, and the idea of a brand elevating to mythology. As Lotus completes the long and painful process of being absorbed into IBM, could they, as Seth describes, invent a mythic brand with a story that promises to deliver an heroic outcome rather than just a product and a pile of facts. I believe it is possible. Ironically, by dropping the brand, it may elevate it to mythology. What do you think? The first edition of the PACLUG user group conference was held this week at the Planet Hollywood Hotel & Casino in Las Vegas. The two-day event was scheduled to piggy-back the View’s AdminDev2011 conference. They actually overlapped schedules a bit on Wednesday and PACLUG was invited to the keynote presentation of AdminDev2011. The Tuesday sessions of PACLUG were focused mostly on Domino-related topics while the second day was mostly related to Websphere Portal. Had I known this I might have been tempted to skip the Wednesday sessions, but after attending them I can say that to do so would have been a big mistake. I got some very valuable information in those sessions. After all, as technology professionals, it is important to keep up with the changes in technology. Simply put, if you’re in IT, you had better be prepared for a lifetime of learning to follow the technology and stay employed. And for many of us, that’s great. If we aren’t learning something new, we’re quickly bored. If this isn’t you, you’re probably a really good COBOL programmer working or a bank or insurance company. If not, then you should be planning your next career. The knowledge I gained in the sessions was useful, but as I find with all of these conferences, the meat of the value of the conference is in connecting with new friends and reconnecting with old ones. I don’t care how well connected you are via the Internet, nothing could ever match the rapport developed and connections made by face-to-face meetings, not to mention the “accidental meetings” with people you weren’t looking for. That said, it was disappointing to arrive early on Monday only to watch the tweet stream talk about how people were not coming in until late that night. It would have been good to put an informal pre-conference social gathering on the agenda for early arrivals. This is the REAL Social Business. For comparison, take the phrase “computer dating.” It’s a terrible misnomer. All the computer does is get people connected. The dating part always takes place meeting face-to-face. This is equally true for developing business relationships, though you probably put less emphasis on what a business contact looks like. Sponsorship for this conference was amazing! There was no fee to attend the user group portion of the conference. It was FREE. Thanks to GBS, Panagenda, Team Studio, IBM, Elguji, BCC, ExtraComm, The View, and all the other sponsors. ( http://www.paclug.org/sponsors ) Also thanks to the organizers, especially David Stephens. The conference was lightly attended, but this was only the first time this event was held. From the positive feedback, I expect it will be more popular next year. (speaking of feedback, there was no opportunity to submit feedback formally. That would have been very useful to improve future events.) Perhaps joining it with AdminDev2011 detracted from the attendance of each? I don’t know about that, but I do know I had a chance to meet with people at PACLUG that probably would not have been there if it were not connected to The View’s AdminDev2011. I’m not so sure about Las Vegas in June either. The high temperature was 104F – 108F degrees for the 3 days I was there. Not being a gambler, the extra-curricular activities were limited. Personally, I went to this even in spite of it being in Vegas, not because of it. WOW! An IBM Sametime ad via Google Ad seen while viewing a youtube.com video! Check out the banner ad in this screenshot of a youtube video. It was served up to me by Google while I was watching a whitewater video on youtube.com. Could this be part of a REAL advertising campaign showing a REAL product?! It isn’t exactly obvious what in the ad what the product is or does, but it’s getting the Lotus brand in front of people. Hopefully the ad selector doesn’t just show it to people who already know Lotus. Don’t get too excited about one ad, It’s like one raindrop. But as we whitewater kayakers know, with enough raindrops, a little creek can be turned into a fun, raging river. Comments Off on WOW! An IBM Sametime ad via Google Ad seen while viewing a youtube.com video! One of the very first Lotus ads. Anybody know when this was made? Old school Lotus info-mercial. I love the Monty Python style. But it looks like they didn’t know how to explain what Lotus software was back then either. If anyone knows the history behind this ad, please share it with all of us. I was going to slideshare.net to post a presentation of my own when I happened upon this presentation about storytelling and social media. It was appealing from the very first slide. Having just finished a college level, 5 credit-hour course on digital storytelling, I have a new perspective on this topic. Storytelling is an important part of getting people to hear your message. Whether you sell Lotus software to the people in the business world, give presentations at Lotusphere, write a blog, or just have a linkedin profile, understanding this topic will have a huge impact on getting the results you seek. There are actually two things to note about this presentation. 1. The style and structure of the slides. Visually appealing, Very few words, yet it yields a powerful message. 2. The content of the presentation. The message it contains. As you sit through hours of sessions at Lotusphere and view their presentations, ask yourself how their presentations could be enhanced by incorporating the style of this presentation and the storytelling techniques it describes. Promoting Lotusphere to college students: Learn about careers in Lotus software for web dev tools, social media and more! It’s great to see an IBM business partner stepping up and making an effort to promote careers in Lotus software at colleges and inviting students to attend the opening day of Lotusphere 2011 is a fantastic venue for showing IBM’s stuff to the workers of the future. As an online prelude to the free attendance to opening day, they take visitors through a quick history of Lotus software and a lesson on xpages development. Students, it’s easy to think Microsoft is the end-all for software. The reality is IBM is the leader in business software. They just don’t make a big deal about it.